My friend, Jere, is the author of the most wonderful blog, Blind Prophecy. This Memorial Day, he went to the Cincinnati Zoo. He was looking for an inventive and enjoyable way to fit exercise into his day. I love to see people enjoying the cities in which they live. Sometimes it seems like we don’t spend enough time being tourists in our our towns. Congratulations to Jere for making this Memorial Day memorable! Kevin has had a frustrating experience with the Virgin America website. He was trying to book a flight, ended up getting charge for TWO flights and they still want to charge him for the extra seat. The most frustrating part of this entire episode is how it feels like we’ve been blamed and then penalized for an error on their part. All the good will garnered through their savvy multi-million dollar marketing, fancy mood lighting and in-air WiFi was washed away because of one website error they wouldn’t take responsibility for. Virgin is supposed to be the coolest and hippest way to fly with their electrical ports and Internet access, but one bad experience with their buggy reservation website killed all of it. Bad form, Virgin America, bad form. 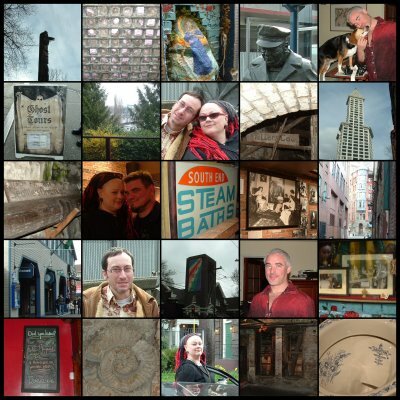 In the collage is an afternoon of us walking about the pier, various photos of downtown, and of the Underground Tour. I love to see photos of people’s trips to various places, but I especially love this 5 By 5. It’s a great snapshot of a weekend in time. 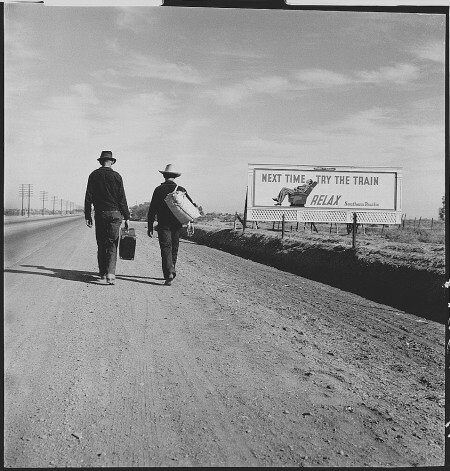 I love this photo from 1937 of two men walking on a road.